Looking for Summer Camps in Thousand Oaks? 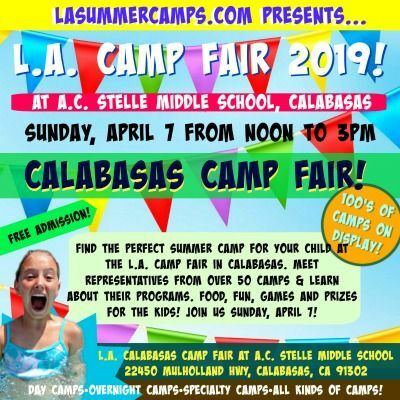 Come to the L.A. Camp Fair on Sunday, April 7 at AC Stelle Middle School Calabasas and Meet and Greet Staff From Over 50 Programs all in One Place! Don't miss the L.A. Camp Fair in Calabasas on Sunday, April 7. Whether you're looking for a day camp, sleepaway camp, specialty camp, or any other kind of camp for your kids this summer, you'll find as many programs as you can handle at the Calabasas Camp Fair. Designed specifically for Thousand Oaks families with camp age kids, the Camp Fair takes place at nearby A.C. Stelle Middle School in Calabasas. This is completely free event will feature over 50 different camps and programs on display. Go booth to booth and table to table meeting camp counselors, activity specialists, and camp directors from all of the participating programs. Pick up free brochures and promotional items and get all your questions answered. There will be games and activities for the kids, not to mention delicious food and a chance to win a free camp session, too! Savvy Thousand Oaks families know the best place to find the perfect summer program for their kids this year is at the L.A. Camp Fair in Calabasas. Tickets are free, so get yours here. Hope to see you there!